Yesterday the members of First Baptist Church in Sutherland Springs, Texas went to morning worship service like they do every Sunday. At about 11:15 AM, a man wearing combat gear burst into the church with a semi-automatic rifle, killing at least 26--- many more were wounded. Many are asking, "Why does God allow bad things to happen to good people?" We are continuing to learn the details of yet another act of violence---this time the massacre of Christians attending a Sunday morning worship service at their church in a small town in Texas. We will learn more throughout the day today as authorities continue to put the pieces together. All news organizations were reporting on this tragedy, however, I felt CBS and Breitbart News had some of the most comprehensive reporting as of last night. Both linked above are continuing to update this story. 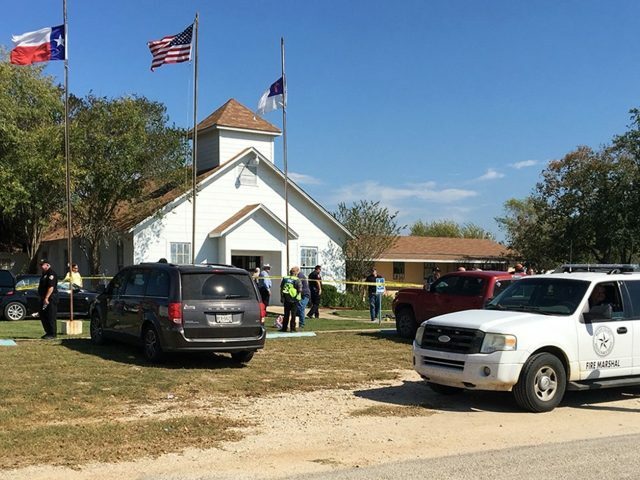 SUTHERLAND SPRINGS, Texas -- A gunman opened fire inside the First Baptist Church in Sutherland Springs Sunday, killing and injuring multiple people, authorities said. A law enforcement official confirmed that the gunman is deceased. He was shot after a car chase with police, but it's unclear if he shot himself or if he was shot by police, CBS News' senior investigative producer Pat Milton reports. The daughter of the church's pastor was one of the victim's killed in the shooting, her mother Sherri Pomeroy told CBS News via text message. Apparently the pastor and his wife were both out of state Sunday. President Trump Tweeted, "May God be with the people of Sutherland Springs, Texas. The FBI and law enforcement are on the scene. I am monitoring the situation from Japan." This comes a little more than a month after the massacre of people attending a country music concert in Las Vegas. President Trump's words then may help to shed light on the questions many are asking now. Last month the president called the act of violence in Las Vegas an "act of pure evil." In his address from the White House, he pointed to Psalm 34 to comfort the nation. He said, "Scripture teaches us the Lord is close to the brokenhearted and saves those crushed in spirit." His words tapped into the hard to answer questions that follow any tragedy of this kind---"Why?" Russel Moore, the head of the Ethics Commission for the Southern Baptist Convention, responded to the Las Vegas tragedy with words that are equally relevant to this one. People were, and are asking, "Where was God in all this?" In this case, people go to church and get murdered in the pews? Why? The following are some things to consider, while we learn more about this latest unthinkable incident. Sometimes people are quick, too quick, to assign blame for sin, or sinfulness to those who are harmed in these attacks. There is no question God chastens through natural disasters and tragedies, however, Jesus was clear when this question was posed to Him. In John 9:1-12, Jesus' disciples asked whether a man's blindness was the result of his or his parents' sin. Jesus said neither. We live in a fallen world, where awful things happen. When these kinds of evil are put upon people, Scripture calls us to first stand where God does and see it for what it is---evil. Not the illusion of evil, but evil itself. Often we are pressured by non-Christian friends and the secular public in general to give a full explanation of why God does what He does and sometimes doesn't do what we think He ought to do. The New Testament speaks of the "mystery of iniquity" (II Thess. 2:7). When tragedy fell upon Job, he asked God why, but God didn't give him a complete answer, rather God spoke of His own power and His own presence. God, as the hymn says, is both "merciful and mighty"---He stands against evil and violence, and we know that He is present and very near to those who are hurting. We also know that ultimately God will dispose of evil altogether as He ushers in His Kingdom. God brought the full measure of sin and evil to His Son on the cross. In the cross, we see horror, terror, and evil, but we also see that God is there. We see an empty tomb. As the Lord is close to the brokenhearted, so must we be close to them. We must be the people of the cross, as well as the people of the Resurrection. God gave man authority in the earth. He doesn't always exercise it in godliness, which is why he sent his Word to heal us. This life is only our beginning. There was a captain on Deadliest Catch who said that "Every story needs a beginning, a middle, and an ending." I believe it was captain Harris. If we are only at the beginning, or in the middle, we might not yet know the rest of the story, or we might only know it in part. Satan and those he controls will continue to attack others when they are in places that are most vulnerable: churches, schools, hospitals, etc. As he gets more desperate to inflict harm, we should be planning to protect these vulnerable places. Look at how the perpetrator ran at the first confrontation by someone who was armed as he was. So what part of the gospel is the world going to go after next? Will it be Romans 13, the part about higher powers being given a sword which is to be used for keeping crime from happening? Yes, higher powers do have a responsibility to protect. This is why they are to be somehow armed. It takes power or authority to overcome unrighteous power, or attacks from the enemy. This is why we need 2nd Amendment rights. The use of deadly force is indeed a part of the gospel. It's right there in the book of Romans. I believe our Constitution is recognized by God. It is to be the law of the land, for America. It's a pretty good piece of work, refined as much as it has been, through some fiery trials. It wasn't easy in the making, I'm sure. This murderous thing could have been much worse, if it were not for the intervention of an armed citizen who shot the killer, resulting in his death. Too bad all the ushers were not armed that day. It could have turned out much better. We can not count on our government to keep us safe to the end that they are the only ones authorized to have guns, especially not when they let in the killers basically not vetted, and then harbor and protect them, or work to undermine every bit of morality, and the free exercise of legitimate religion. For such reasons, our founders made provision for our protection, by means of the 2nd Amendment. The Constitution is to be the highest power in the land, in America, as far as his governing is concerned. It certainly makes room for Almighty God to have his rule through his people. It really does, and we need that room, that provision, which our government seems to want to take away also. We the people have been given a sword. It's in our Bibles. It's in the gospel. Oddly enough, several years ago the board of our church asked some of us who have concealed carry permits to sit in locations where we would have a clear view of people entering our sanctuary. This morning a friend and fellow congregant mentioned both he and his wife are going in today to apply for concealed carry permits.